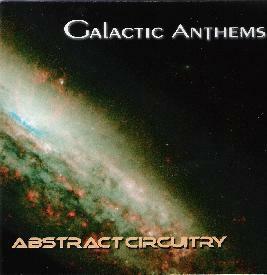 Galactic Anthems - "Abstract Circuitry"
Electronic musician Glen Adams, aka Galactic Anthems has chosen an appropriate name to work under. Indeed, the music on Abstract Circuitry often has that enormous, spacious feel you would expect a "galactic anthem" to have. But Adams also blends these gigantic cosmic sounds with new age melodies and techno influences. In some tracks, like the title track, there's even a touch of kitschy 70's space disco, like Meco or The Space Project (anyone remember them??) stepped into the studio for a moment. On other tracks, like the creepy Madness, he takes a bit more of an experimental approach, layering spacey atmospherics and minimalist rhythms with ultra-freaky moaning sounds. While most of the pieces do have sequenced rhythms and electronic percussion, unlike electronica or techno, the rhythms are not the primary focus of the music. The atmospheres, textures, and melodies take center stage here. Nor is the music on Abstract Circuitry like the meandering, improvised explorations of 70's electronic pioneers either. Adams' music is has a definite structure to it, even the few pieces without rhythmic sequences, like the mellow new agey Downtime or the extended epic cosmic journey of The Enchantment. In his punchier more upbeat pieces, it reminded me a bit of Spiral era Vangelis, whereas his mellower, spacier pieces were more like the style of music the Hearts of Space label was putting out in the 80's and 90's. So if you like that kind of stuff, you're sure to like Abstract Circuitry. Contact via snail mail c/o Glenn Adams; 6135 Fescue Dr; Colorado Springs, CO 80918.